SCVHistory.com LW2889 | Film-Arts | Theater Check Used to Rent 'Ridin' Luck' (Trem Carr 1927). 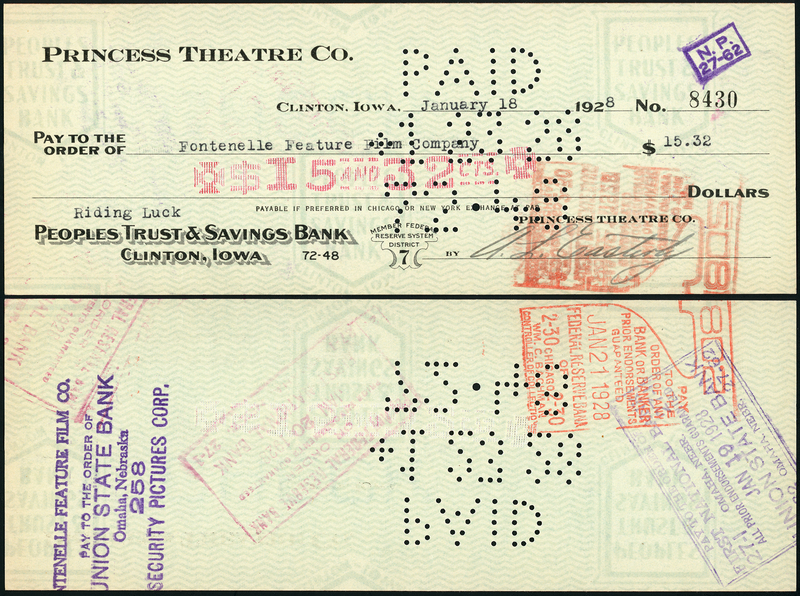 Business check for $15.32 used by Princess Theatre Co. of Clinton, Iowa, dated Jan. 18, 1928, drawn on People's Trust & Savings Bank of Clinton, to rent the 5-reel silent movie "Ridin' Luck" (Trem Carr Pictures, 1927) under the "states rights" system. "In the states rights method, producers sold their films on a territorial basis to a local salesperson" — in this case Fontenelle Feature Film Co. of Omaha — "who extracted as much money as possible from the movie until the worn and scratched film print literally fell apart from sheer use. ... Copyright holders sold the actual copies of their movies; films were sold by their length, usually 10 cents per linear foot of film. This method was ideal for short films that had brief stays in the nickelodeons. But for feature film distribution, states rights proved ineffective. The producer made money on the initial sale of the film print, but the states rights salesperson reaped the largest rewards. Producers had slim profit margins while many films failed to return their costs" (— Society of Independent Motion Picture Producers). 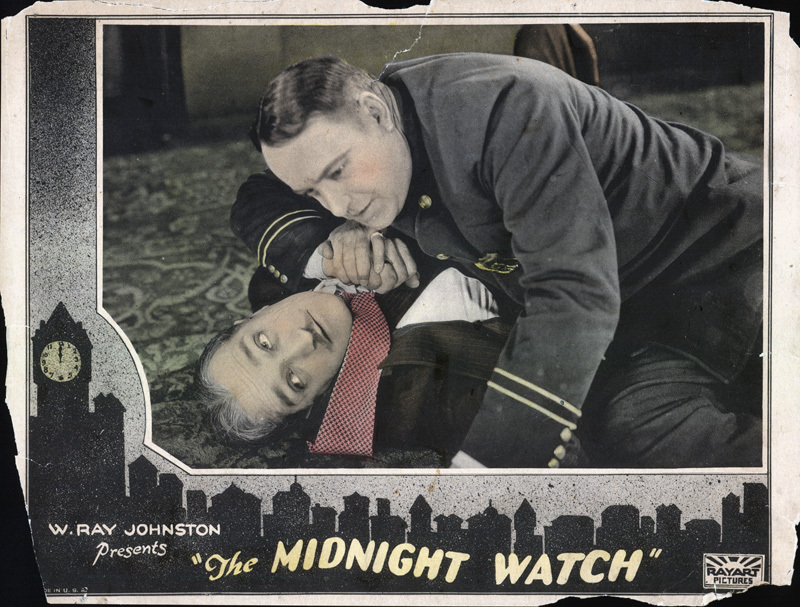 The distributors also failed to return many of the worn-out films ... and often with independents like Trem Carr, there was no film vault to return them to ... which is why this film, like at least 70 percent of all movies from the silent period, are "lost." 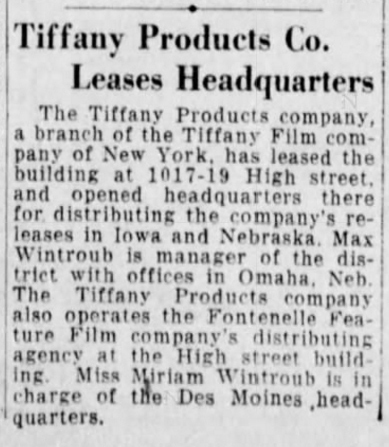 Fontenelle's Omaha agency (at 1017-19 High Street), which distributed films in Iowa and Nebraska, was operated by Tiffany Products Co., a branch of Tiffany Film Co. of New York (see Des Moines Register, Oct. 6, 1926). Tiffany Productions started in 1921 and was Povery Row studio from 1927-1932 that actually distributed several of Trem Carr's other films starring Bob Steele and Ken Maynard. W. Ray Johnson's Rayart Pictures Corp. handled the theatrical distribution of "Ridin' Luck" — so Rayart would have sold prints to Fontenelle and other regional operators. "Ridin' Luck" was released in November 1927 during Carr's second year of eponymous production. It starred Ken's brother, stuntman Kermit Maynard, together with Ruby Blaine, Jack Anthony, Charles O'Malley, Charles Schaeffer, Art Wilting and Marshall Ruth. "Ridin' Luck" is directed by Edward Gordon and written by Arthur Hoerl and Francis James, with cinematography by Hap Depew. Since it doesn't exist, we can't be sure where this film was shot, but Carr was already making movies in Placerita Canyon the year before, both on his own and in partnership with others. The following year, 1928, Carr and Johnston formed Syndicate Pictures (Johnston as president, Carr as vice president). In 1931 they reorganized Syndicate into the first Monogram Pictures Corp. Carr took out a 5-year lease on property that is now part of Disney's Golden Oak Ranch, just east of present-day Highway 14. When the lease expired in 1936, Carr picked up sticks (literally) and moved to property his friend Ernie Hickson had purchased at the present site of Melody Ranch. In 1940, Johnston bought the main house at 22931 8th Street (corner Wayman) in Newhall that vaudeville actor Charley Mack built in 1928. LW2889: 9600 dpi jpeg from original check purchased 2017 by Leon Worden.